Farming Foible, or an Agrarian Adventure? : Death to Buttercups! I have been away for awhile dealing a family emergency. I am really not good at being creative when I am stressed. Actually, I am not good for much except laying around in various positions of pathetic on the couch when I am depressed stressed; which is what I have been. That is one reason I love being on a farm so much. It gives me a reason to get up. I can’t wallow all day in my pajamas. Well, okay I can, but pajama pants and hay don’t merge well together; and it is really hard to wallow when the calves are bouncing and the joy of the world in spring is beating your senses down. Stupid beautiful spring days mocking me with their serenity and joy when all I want to do is wallow. Ah well, inevitably the pretty days and responsibility win out and I am back to being normal. Albeit somewhat resentfully so when I came up from the depths again just as we had hay down! I kinda wish I would have wallowed just one more day! Things in the garden are growing well. Sorta. We had both a record low (frost, YAY!) and a record high (why is it 93 in May? WHY?!?) Lettuce is up and ready to be thinned and the radishes are almost ready to be eaten! I actually snuck three last night and they were GREAT! Strawberries are starting to ripen, and blueberries are formed and ready to go. The winter garlic and shallots are almost ready to dig, and my potatoes are huge already. The corn is not coming up like I would like, and neither are the beans, but I am thinking of heading out to buy a packet of seeds or two and start again with them. The weird weather in southern IL might be the cause. Or birds. Or rabbits. Who knows! But I am blaming the super cold ground temperature for killing my precious babies. Oh well, that’s how it goes. Good thing I can still go to the grocery store if I need to! In other news I started a low carbohydrate lifestyle change last Monday, and so far so great! I have had a few strawberry and apple cravings, but I have not missed bread at all. I think it is going to dove tail well with my desire to eat more in season fruits and vegetables out of my garden and from the farmer’s market. I didn’t realize it before but all of the lettuce, radishes, squash, zucchini, pumpkins, asparagus, peppers, and pumpkins are acceptable for a low carb menu. That works great for me, because I prefer cheesey baked summer squash to Kraft blue box any day of the week. I got both of my parents involved too, so I get the social aspect of eating with them without the Chinese take-out calories. Win win! In other news, we spent all weekend updating the garden, trying to see what was going to pull through, and what was a goner. It was unseasonably warm, and I was a little too dramatic about being hot. Dad borrowed my grandpa’s tractor and used the manure spreader all day to remove Mt. Horseapple and the Cowpoopia Mounds from our landscape. Finally. Unfortunately, dad left the gate open when he got done. That inevitably led to the cows getting loose. Reports say that dad rushed inside because he needed back up and long story short mom had to herd cows in a bath towel. I am glad her super powers are still working (and that I was in a theater with my phone off, darn!). 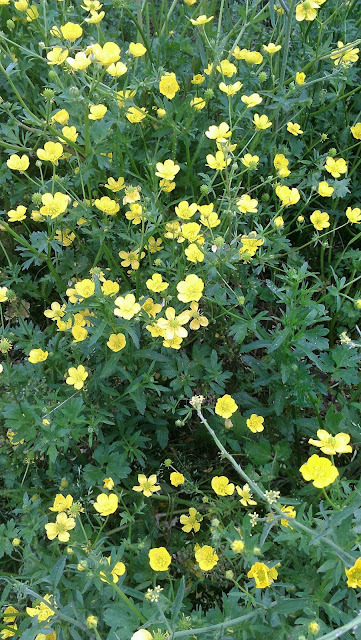 We also identified the yellow flower of doom (IE Creeping Buttercup) which has taken over our pastures. It looks as if my Memorial weekend is going to be full of plant killer. That stuff is highly invasive, toxic to animals, kills grass, and it is very caustic when mown. It has to go. Good thing it should only take SEVEN years of spraying for us to eradicate it. Ugh. There goes the fence fixing or barn cleaning that I had planned!